When the influential advertising agency Collett Dickenson Pearce (CDP) was asked to produce a campaign for Benson & Hedges cigarettes in 1977, the company chose Brian Duffy, one of the most high-profile photographers of the period. Duffy was part of the new generation of photographers that emerged in the late 1950s and early ’60s. 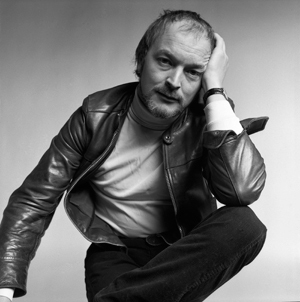 Together with friends David Bailey and Terence Donovan – a gifted and outspoken trio Norman Parkinson called ‘The Black Trinity’ – he had created a fresh, informal style of fashion and portrait photography that helped define the era. He was strong-minded, opinionated and known as being ‘difficult’ to work with. ‘Cantankerous was a word made for Duffy – it was just his character,’ Bailey told The Daily Telegraph in 2010. ‘It was never going to be dull with him, because he was always going to pick an argument somewhere down the line.’ He was also a perfectionist, who knew exactly how to translate his creative ideas into arresting photographs. Duffy had worked as a freelance photographer on various advertising assignments from the early ’60s. However, when he was invited to discuss ideas for the Benson & Hedges shoot with CDP’s art director Alan Waldie, it was clear that something different was being planned. At that time, Government restrictions prevented people being shown in tobacco advertisements, so a completely new approach was required. Over lunch, Waldie drew rough sketches on a napkin featuring packets of B&H cigarettes. As with Surrealist art, these pictures aimed to surprise and intrigue the viewer by replacing the objects people expected to see in a particular scene with something incongruous – in this case, a packet of cigarettes. Duffy’s brief was to turn this idea into photographs. All the images were to be created in Duffy’s studio in London’s Swiss Cottage. 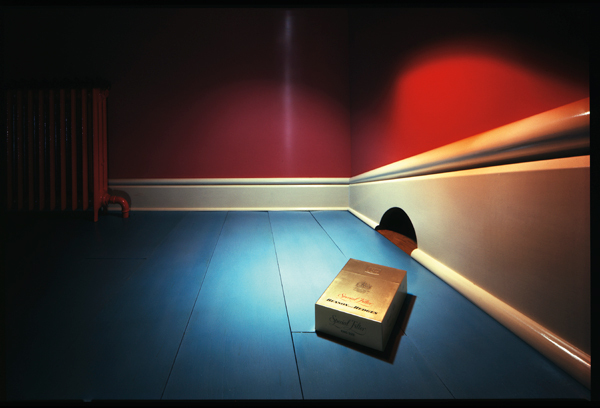 The first one of the series showed a cigarette packet outside a mouse hole in a skirting board, in the place where a mouse trap would normally appear (above). Duffy shot the scene using four or five different lighting set-ups before he was happy with the image. It established the style of the campaign and he moved on to the next image, ‘Birdcage’. The ‘Birdcage’ image showed what appeared to be a green-painted room bathed in late-afternoon sunlight. To the right of the image was a cage with a B&H packet on the perch, but the shadow on the wall behind showed a bird in the cage. Two more images in the series followed: one showed a matchbox with a bird’s egg inside, out of which had ‘hatched’ a B&H packet; another featured a gold ring with a cigarette packet set into it. The campaign was an instant success and the images were regularly shown in newspaper and magazine spreads and on advertising hoardings. These images became regarded as some of the most original in the history of advertising and garnered a number of industry awards. Duffy shot just one more in the series before refusing to do any more, as he felt uncomfortable shooting tobacco advertisements. The series continued, but with other photographers following his lead. Duffy went on to produce images for Smirnoff vodka before suddenly abandoning photography in 1979 and burning much of his work in a garden bonfire. Afterwards, he directed commercials before working as an antique furniture restorer. He died in 2010. Although Duffy was famously dismissive of most of his advertising work, his son Chris believes that he would have appreciated the importance of the Benson & Hedges campaign. ‘Duffy always executed a job to the best of his ability and would have enjoyed the challenge of doing something that was so different at the time,’ he says. ‘He would have recognised that these images were going to break new ground. Books: The recently published Duffy… Photographer features Duffy’s portraits, fashion and advertising work plus an account of his career in his own words. It is published by ACC Editions, price £45 (visit www.accdistribution.com). Websites: Duffy’s official website is www.duffyphotographer.com, which includes a range of his best images plus biographical material, articles and links to interviews.